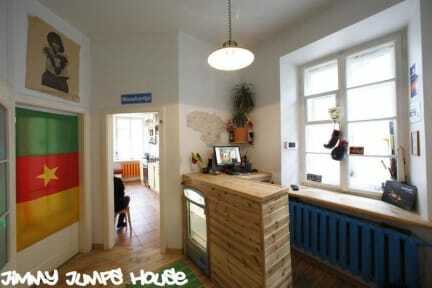 With 'a free waffle breakfast to die for' and 'a feel-at-home atmosphere', the Jimmy Jumps Hostel won't disappoint. 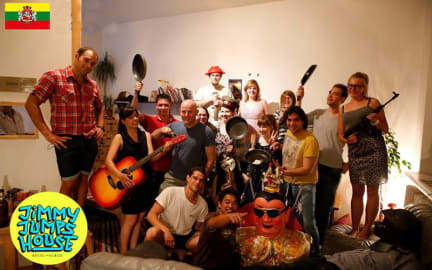 The hostel offers an impressive inventory of tours and activities (you can try everything from 'machine gun tours' to 'forest saunas') and with a comfy common room and outdoor terrace, there's plenty of opportunity to meet new people. You can reach Jimmy Jumps easily from the central bus station, and its central location makes it easy to explore the Old Town's biggest sites. Check out the main square and the town hall, just a 5 minute walk from the hostel front door. Just loved it! Really clean, good location, spacious and comfortable room. The staff is amazing, nice and helpful. My friends and I had the best time there! I’m definitely planing to go back to this hostel next time i go to Vilnius. Highly recommend! Ive stayed before, and theres a reason I come back when Im in Vilnius. Great place, they renovated it since I was last there. Staff was cool as usual, Indre was amazing, and now they have a bar which is cool af, Best location in town, only complaint would be my bed didnt have a reading light, but they tell me thats in the works. Love you girls! Perfect hostel if you want to explore Vilnius. Close to the city center, cheap, and great company. Workers are knowledgable of the area and will give you suggestions on things to do, places to eat, etc. Rooms are spacious enough and the beds were also pretty comfortable. Free waffles in the morning as well as tea and coffee whenever. Theres a bar as well, I came on a sunday-monday but heard it gets really fun on the weekends with the pub crawls and such. 10/10 would recommend. To be honest my expectations weren't that high after reading some bad reviews but Jimmy Jumps exceeded them anyways. Really nice little hostel. Clean, warm and perfect location. Probably one of the nicer hostels I stayed in and the cheapest. I definitely would recommend if you are only in the city for a few nights. My biggest concern with the hostel is breakfast times. It’s weird that it starts at 9. And as far as I understand, staff can start cooking earlier but the previous shift did not tell that there will be people leaving earlier so in the morning I got only sorry. Well... just change time of the breakfast for earlier and people won’t have to face staff who either don’t care or don’t want to be nicer. The room and beds were fine, bathrooms were clean. Lockers, wifi - good. NB! Storage is not locked. Jimmy Jumps is in a perfect location and the English speaking staff really helped to make my stay more enjoyable! The hostel was clean, but the no shoe policy left a bit of a funny smell...and some bathrooms didn’t have soap or hand towels. Overall it was fine for a few nights and everyone was friendly. The rooms and common areas not clean. The breakfast totally bad.